In February 2015 Mannequin records in Berlin released a double CD/Vinyl LP official compilation of the groups work from 1983-1986, covering the albums ‘Laughing Afternoon, ‘Hope’, ‘Preparing for Power’, ‘The Spike’ and ‘Bourbonese Qualk’. Mannequin Records is proud to present a CD compilation of one of the most important Industrial bands active during the 80’s in the UK. 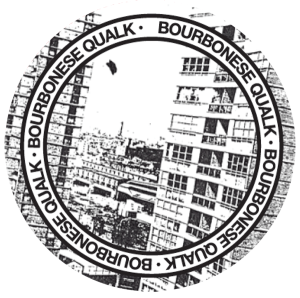 Bourbonese Qualk were an experimental music group from England who where active from 1979 until 2003. Throughout this period they had a number of different line-ups but this album concentrates on the period from 1983 until 1987 with the trio of Simon Crab, Julian Gilbert and Steven Tanza. During this time the group released five albums: ‘Laughing Afternoon’, ‘Hope’, ‘The Spike’, ‘Preparing For Power’ and the self-titled ‘Bourbonese Qualk’ on their own Recloose Organisation and New International Records labels. The group were always obsessively and uncompromisingly focussed on controlling their work – they ran their own record label, recording studio, tour organisation and music venue (the notorious ‘Ambulance Station’) – they refused to integrate into the commercial music racket turning down publishing deals from major labels – stubbornly opting for total independence. The group are known for their political activism which was formed in the crucible of the 1980s Britain: The Miner’s Strike, Falklands/Malvinas war, Anti-fascism, Thatcherism, Moneterism, squatting/housing, local government corruption, anti-capitalism, and Anarchism – which was further re-enforced by touring Europe and meeting like-minded groups and organisations. Bourbonese Qualk saw their music as a revolutionary cultural force – a belief that radical musical forms must be part of positive social change. Despite this position, the group avoided dogma, cliché and propaganda, preferring to let their audience come to their own conclusions – their work was often ambiguous and directly critical of cynical power-politics of any color – often irritating members of the traditional ‘organised left’. In 1984 Bourbonese Qualk occupied a large empty building on the Old Kent Road in South London which they turned into a base for their activities and a co-operative for artists, musicians and writers as well as a centre for radical political activism – specifically as a co-ordinating centre for the ‘Stop The City’ anti-capitalist riots of 1984-1986. Most of the recordings on this album were recorded in their studio at the Ambulance Station. The group never record in a ‘proper’ studio (not that they could ever afford to), choosing instead to work with their own extremely basic equipment (at a time when home studios were very unusual – the unique raw sound of these recordings is the result of their choice – which now, ironically, is in vodue due perhaps to the overwhelming obliquity of ‘clean’ audio digital production tools. If Bourbonese Qualk have a legacy, it is that ‘culture’ should be reclaimed, re-defined and owned by the people, wherever they are, however small and not by the state or the market and that ‘culture’ is a vital vehicle for debate and radical change. 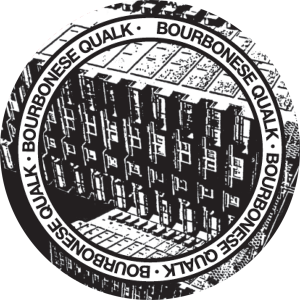 The intensely political Bourbonese Qualk, formed in 1979, was one of the early experimental groups building on the work of pioneers like Throbbing Gristle and Cabaret Voltaire. During the period documented on this double album Bourbonese Qualk were the trio of Simon Crab, Julian Gilbert and Steven Tanza. Even compared with their contemporaries, BQ were staunchly independent, and did everything themselves: design, recording, and releasing several albums on their own Recloose label, as well as others. 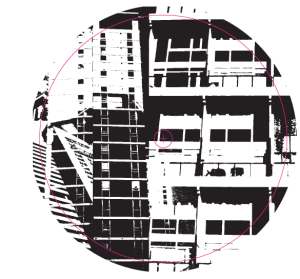 This welcome release collects 26 tracks from the British industrial group’s middle years, 1983-1987. 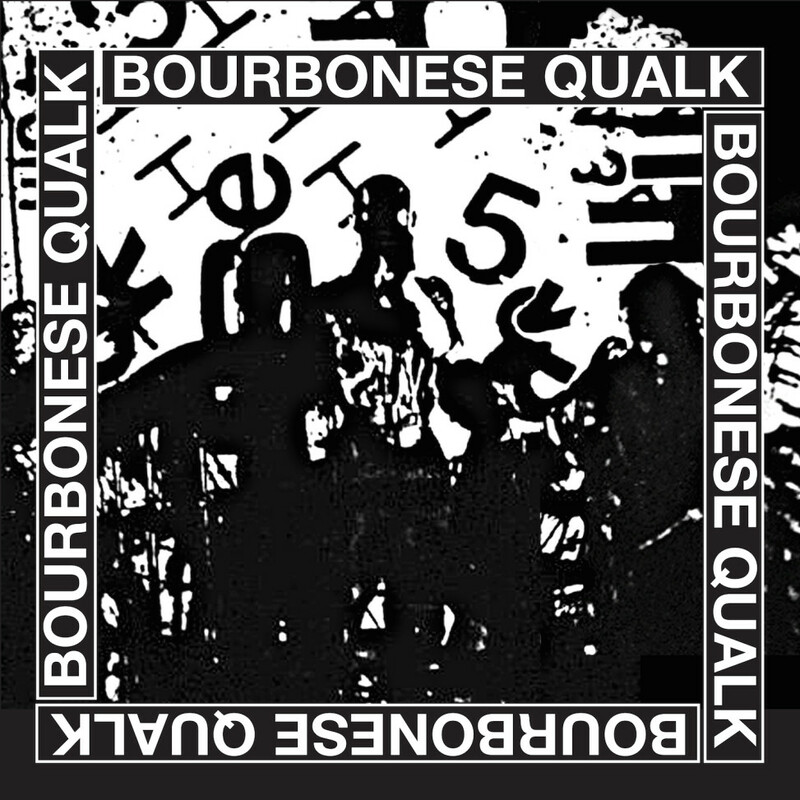 Describing Bourbonese Qualk as “industrial” merely situates the music in a milieu — whether the band’s members considered themselves part of the “industrial scene” is hard to say, though the politics were likely in sympathy. They never achieved much notoriety, but neither did many of their compatriots like Club Moral, Het Zweet, and even Attrition. All of these groups appeared on a variety of cassette and LP compilations, and Bourbonese Qualk themselves released a series of albums. Most of the songs collected here come from their first five albums, starting with their debut,Laughing Afternoon, though some tracks appear to be previously unreleased. I don’t come to this review unbiased: back in the mid-80s I stumbled across the band on compilations, then tracked down their albums. Bourbonese Qualk were always a hard group to categorize, which of course is part of what made them interesting at the time, and makes them interesting still. It would be untrue to say that these songs don’t sound dated — they do, but in a good way. Many are based on simple drum machine rhythms, with the echoing samples and cheap synths of the time, what I think of as the cassette culture sound. Songs like “Blood Orange Bargain Day” and “To Hell With Consequences” could be early Cabaret Voltaire outtakes, with a similar claustrophobic, electronic atmosphere and distorted, sloganeering vocals. The heavy reliance on solid rhythms makes Bourbonese Qualk’s music still sound vital, whether in the muscular robotic chug of “Sweat It Out” or the unceasing electro-pulse of “Head Stop.” There are pretty pieces as well, such as the keys and woodwinds of “There Is No Night” or “Outcry,” which morphs from a pulsating synth to echoing guitar notes that gently float away. But for the most part, this is tense, dark stuff, with a fair share of Throbbing Gristle-ish delayed vocal sounds, jittery beats, and experimental voice samples. It’s good to see Bourbonese Qualk get their due; hopefully this set illuminates another dark corner of the UK 1980s musical world and introduces new listeners to a unique, important group. I expect many will find themselves wondering, in surprise, why they’d never heard of this intriguing band. Bourbonese Qualk were so elusive even labeling them with the shape-shifting ‘industrial’ tag seems a mistake. Yet that’s what history has done, so despite the post-punk overtones, avant garde flashes, experimental synth buzzes, awkward quasi-funk, cold/darkwave accents and noisy nuisance, BQ’s spot in the Dewey Decimal system of modern music is secure. That shouldn’t discourage you from delving into 1983-1987 because the material therein has had an outsized influence on that which followed. Modern underground darlings German Army (covered last column) wet their beaks in the Qualk trough, as did older acts like Disco Inferno, Atari Teenage Riot and the electronic musicians of the late ’90s in general. And yet that still only covers a small swath of what Bourbonese Qualk accomplished from 1983-1987 (just imagine trying to compile their entire output; that’s the stuff of insanity). And what are we supposed to do with coy instrumental “There is No Night,” floating in a koi pond of pan flutes? Or “God With Us,” a modern-sounding collision of samples, clumsy half-rhythms and disturbing tones (reminiscent of Houston’s Indian Jewelry in advance)? Don’t even get me started on “Blood Orange Bargain Day”; just know that if you’re ever in the cockpit of an airplane in your dreams, you have a song to wake up to. Does the preceding sound like the work of a strictly adherent ‘industrial’ act? I didn’t think so; drop the labels, folks. I Bourbonese Qualk sono stati una vera e propria cult band di matrice anarchica, un gruppo sperimentale che metteva in scena una musica “industrial” primigenia che andava da un funk abrasivo a collage elettro-rumoristi, registrando con pochissimi mezzi pionieristici lavori lo-fi all’interno di case occupate, in puro spirito underground DIY. Grazie ad un’ottima compilation realizzata il 23 febbraio 2015 dalla label Mannequin Records, cogliamo l’occasione per parlare di questo gruppo, forse non conosciuto come meriterebbe al di fuori del circolo degli appassionati del genere. Quella che abbiamo tra le mani è un’ottima raccolta, curata e supervisionata dallo stesso Simon Crab (autore anche della grafica del lavoro, assieme ad Alessandro Adriani); il lavoro esce in CD (500 copie in digipak) e in doppio LP (500 copie in vinile nero da 160-gr) e contiene il meglio dell’opera deiBourbonese Qualk dal 1983 fino al 1987. Il periodo più interessante della band inglese. I Bourbonese Qualk nascono nel 1979 in Gran Betagna, a Southport, da un collettivo di non-musicisti, squatters e anarchici. Il gruppo, a partire dal 1980, si dedica a forme di musica industrial di stampo sperimentale, utilizzando anche drum machine e sintetizzatori, sulla scia di gruppi come Cabaret Voltaire, Throbbing Gristle e Severed Heads. Dal 1983 sino al 1987 la band è formata principalmente da Simon Crab, Steven Tanza e Julian Gilbert. Nel 1987 Tanza e Gilbert si allontanano dal gruppo (Tanza si dedica al suo progetto The State) e lasciano il solo Crab a portare avanti i Bourbonese Qualk, coadiuvato dal musicista Miles Miles. Dopo la morte di Miles nel 2002 il gruppo si scioglie definitivamente. Dal 1984 i membri del gruppo occupano un edificio a Old Kent Road nel sud di Londra che diventerà il loro studio e la loro casa. La band si è sempre tenuta lontana dalle major discografiche, considerate – a ragione – il nemico di un certo tipo di musica radicalmente alternativa al pensiero mainstream. L’approccio musicale anarchico e radicale era molto vicino ai Crass (come ispirazione) e l’impegno contro le politiche neoliberiste di Margaret Thatcher, a fianco dei lavoratori inglesi, era paragonabile a quello dei Test Dept, altro fondamentale gruppo industrial del Regno Unito, con cui iBourbonese Qualk condividevano la passione per la lotta politica. Come molti altri gruppi inglesi degli anni Ottanta, anche i Bourbonese Qualk, erano avversi all’establishment laburista britannico, che molto spesso non capiva le loro provocazioni. La band evitava accuratamente di cadere in dogmi, cliché e banale propaganda, trasferendo il proprio spirito rivoluzionario non in vuoti slogan, ma nell’innovazione e nella sperimentazione musicale stessa. Si ascoltino brani come Dream Decade o Head Stop per comprendere come la band avesse fatto propria la lezione dei migliori Cabaret Voltaire di Mix-Up, reinterpretandola con originalità e facendo intravedere seminali bagliori futuri, ampiamente sfruttati e riscoperti “ritualmente” negli anni a venire. Non mancano anche episodi rumoristici tribali che mostrano un’improvvisazione free con derive ambient (God With Us) o che richiamano per certi versi l’industrial rumorista dei colleghi Test Dept, come avviene in Erector e nella metallica Deadbeat. Musica orientale e proto-elettro-synth wave si fondono creando interessanti esperimenti psicogeografici (Suburb City). Una traccia comeReturn to Order rimane, anche a distanza di decenni, una delle gemme del gruppo inglese, un brano che si agita nel segno dei Clock Dva più dark wave e funk, con un sax da brividi che s’innesta progressivamente su un ipnotico ritmo dub industriale. Pogrom, tratta da The Spike del 1985, è emblematica dell’influenza e dell’attualità del gruppo: chi ascolta riconoscerà subito che il brano The Walker in Blast and Bottle (2013) dei Raime si apre proprio con il campionamento dell’inizio del pezzo dei Bourbonese Qualk. Si sancisce in questo modo quel debito “simbolico” che lega un certo tipo di sperimentazione elettronica degli anni Ottanta con quella di oggi, chiudendo così il cerchio. 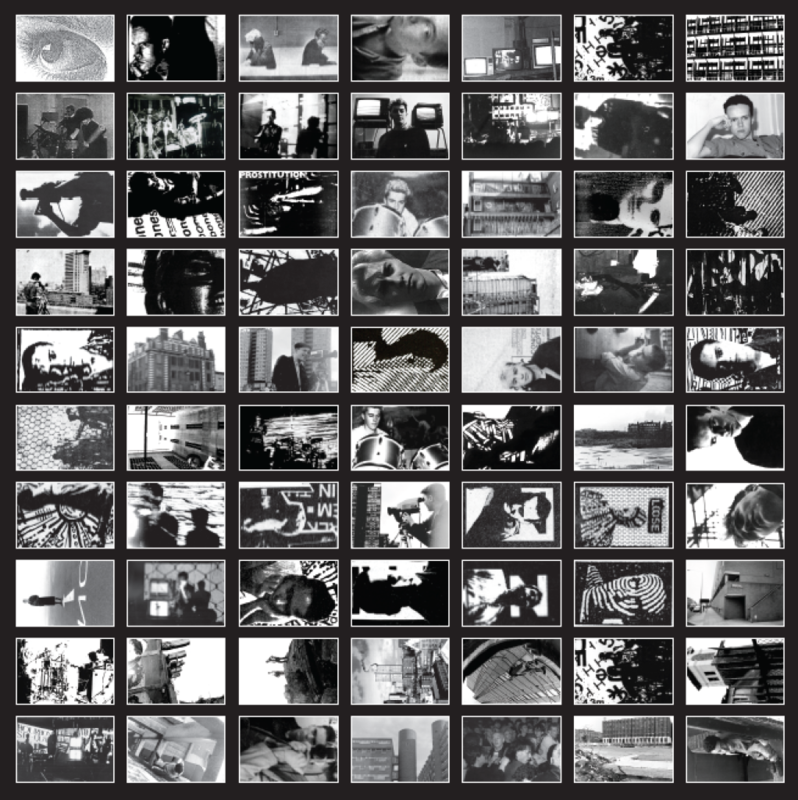 Come se non bastasse, si affianca all’uscita della compilation un 12”, fuori sempre per Mannequin, contenente Lies, uno dei migliori brani deiBourbonese Qualk, remixato in chiave techno industrial per l’occasione da Ancient Methods, una delle più interessanti realtà elettroniche contemporanee, a riprova di certe radici e tradizioni nell’innovazione musicale che si riverberano con urgenza attraverso il tempo e la tecnica. Colonna sonora perfetta della decadenza urbana, tra incubi distopici e sogni libertari, oggi come allora, i Bourbonese Qualk ci mostrano, da un passato mai dimenticato, lo spirito e le forme possibili della resistenza del futuro. This aural document (remastered by the Dutch musician Rude 66) is well worth picking up by BQ fans as well as adherents of quintessential industrial music of the era or anyone looking for some good old noisy 80’s art music a la Coil or Throbbing Gristle. Bourbonese Qualk were as difficult as their name suggests: abrasive, uncompromising, highly conceptual and devoted to specific ideals. As one of the early original industrial bands from the UK emerging in the tumultuous wasteland of Thatcher’s England, BQ would influence many other bands to follow. They were politically active as a musical entity as well as a theatre group. Their music was harsh and often unbearable though it got more listenable and accessible as they shed members until there was just Simon Crab. But it’s aged well especially as a document of late 20th century England. Overall it’s suffused with a defiantly lo-fi quality. Their songs vary from abrasive funk to tape collages to all out noise. Despite the more electronic edge to the later music the earlier tracks have a life of their own, clearly from the early 80’s industrial goulash but unique as well. While they have their roots firmly in the industrial ethos several songs break into beautiful even pleasant sounding territory. “To Hell With The Consequences,” “Gag” and “Shutdown” are highly reminiscent of Mix-Up era Cabaret Voltaire, sounding as if it were recorded on a crisp wrapper found on the floor. Alternately, “Qualk Street” sounds crisp and clean with a snaking delayed drum kit and simple guitar chords (not unlike Red Snapper) but ends in a sizzling tape loop. “Invocation” drives along with kludgy bass and tribal drums in a pseudo-Arabic groove under the murky, echoing lyrics of singer Tristan Stanza. “Head Stop” might easily be confused for an early Test Department track with the pulsating synth bass and drum machine. “Black Madonna” breaks the run of noise completely with Spanish guitar and a ghostly chorus before morphing into more tribal drums and screaming, echoing vocals. “Suburb City” begins as synth pop but slowly devolves into middle-eastern violin playing over 8th note arpeggios from a burbling synthesizer while voices chant on in strange, unknown tongues. “Pogrom” opens with an 808 beat that sounds as if it were played through tinfoil speakers as a bass grumbles out a rough framework with the drums under more sephardic violin work. “Deadbeat” drones on with metallic drums and a driving, single-note baseline while feedback guitars slither over the surface like a snake across an oil slick puddle. “Return To Order” has a kind of fragile beauty to it, with strummed guitars, soprano saxophone and New Order style bass accompanying snarled vocals and background drones. “Outcry” starts out sounding as if it will grow into yet another menacing piece but becomes surprisingly beautiful and almost conventional with guitar, bass and drums plus saxophone playing a gentle groove almost like watching a sunset from council estate tower blocks.